The recent popularity of superheroes could suggest a desire for some highly-powered individual(s) to come and save the beleaguered planet from itself. But the concept isn’t anything new. 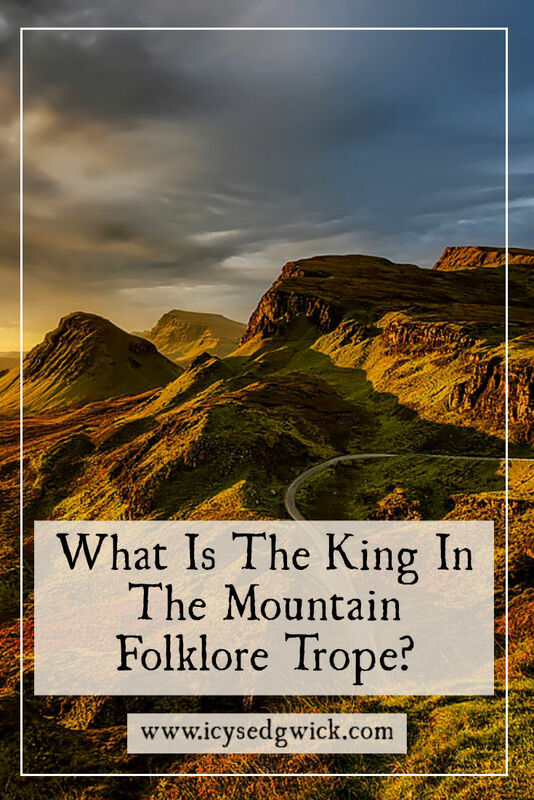 Folklore offers a similar story type, known as the King in the Mountain. The motif is also known as ‘king under the mountain’ or ‘sleeping hero’. Famous examples of ‘sleeping kings’ include Arthur, Ogier the Dane, St. Wenceslas of Bohemia, and Charlemagne. That’s just a tiny sample because many nations have their own version of the legend. We’re going to look at what the motif is, and check out a variation of it. And we’ll also look at why it seems so popular. 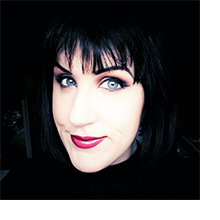 As ever, click below to listen to the podcast episode of this post. Or keep reading! It’s considered folktale type 766 in the Antti Aarne and Stith Thompson system. In its most general form, a legendary hero rests in some remote location. He didn’t die (it’s pretty much always a he), he’s just sleeping. 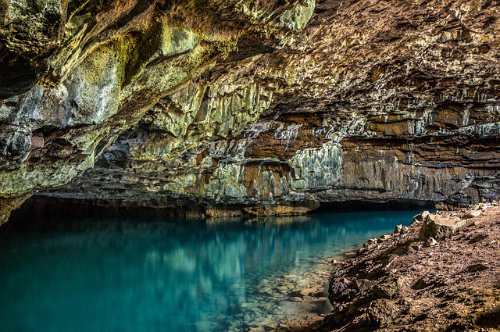 He’s often in a cave, on an island, or in some kind of underground chamber. Basically, somewhere he won’t be disturbed until his nation needs him. Edwin Sidney Hartland points out that the hero is “sometimes believed to be hidden beneath the hills, at other times in a far-off land, or from time to time traversing the world with his band of attendants as the Wild Hunt” (2012 : 233). We’ll cover the Wild Hunt in a future article! The hero often has some kind of military background, and he’s usually related to the history of the nation where he rests. No one knows he is there until someone wanders in for some other reason and finds him. We’ll call this ‘someone’ Random, just to make things easier. At this point, one of two things generally happens. In one version, Random finds a puzzle to solve. When he fails, the hero can’t emerge from his slumber. Random then finds himself back outside the hidden chamber. No matter how hard he tries, he can’t get back in. In the second version, the hero actually speaks to Random. He asks something cryptic, and based on Random’s answer, decides it’s not yet time for him to return. And again, Random gets expelled from the chamber. Sometimes he ages rapidly, or even dies after telling someone his fantastical tale. You sometimes find the tale has a villain instead of a hero. Lovecraft’s Cthulu mythos riffs on this idea, with the Elder Gods poised and ready to return. Or the Norse legend of Loki, imprisoned until Ragnarok. Even horror films like The Mummy play with this idea, with Imhotep waiting to be awakened by a magic spell. In these variations, no one wants the villain to return. Sometimes the hero is not alone, and his whole retinue sleeps in the same place. Here, we see a crossover with the ‘Sleeping Army’ story type. Ernest W. Baughman categorises the sleeping army as motif E502. It refers to “[s]oldiers killed in battle [that] come forth on occasions from their resting place […] and march about or send their leader to do so” (1966: 186). It’s slightly different when combined with the King in the Mountain trope. Rather than just marching about, the sleeping army awaits a signal their return is needed. The stories never really explain how or why the hero and his army end up in the hidden location. Baughman says the soldiers are killed in battle and they emerge from their graves. But that’s not always the case with the King in the Mountain story. Instead, they rest until their nation needs them. J.R.R. Tolkien used a variant of the sleeping army when he created the Dead Men of Dunharrow. Isildur cursed the men for not coming to his aid as promised. Only fulfilling their oath to him (or his heir) would break the curse. The ‘ghost army’ remains beneath the Haunted Mountain until Aragorn calls them to his aid. The brothers Grimm related a version of the legend about Frederick Barbarossa, the Holy Roman Emperor between 1155 and 1190. The legends about Barbarossa claim he’s the only legitimate emperor, and he’ll reappear on Judgment Day. In the Brothers Grimm version, he talks to people to find him and occasionally pops outside. But mostly, he sleeps at a stone table in a cave in the Kyffhäuser mountains of Thuringia. Apparently, his beard has grown around the stone table. In some variations of the story, he’ll wake up when it grows three times around the table. When the brothers collected the story, it had grown twice around it (Ashliman 2019). At one point, a dwarf led a shepherd into the mountain. 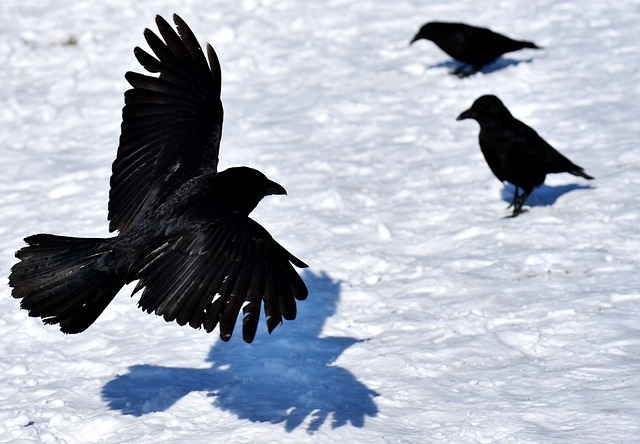 The emperor asked if ravens still flew around the mountain. The shepherd said they did, so Barbarossa replied he should sleep for another hundred years. Given the brothers collected the tale in the early part of the 19th century, I think we’ve safely passed that hundred-year point. The combination of his ambition, military prowess, and political skills made him something of a superman in medieval Europe. It’s almost understandable why a population might desire his return. In the legend, he will return to restore Germany to greatness. But he’ll only do that when the birds stop flying on the mountain. Also, bear in mind that Germany as we know it didn’t exist until 1871. Before that, it was a collection of states. So at some point, someone has updated the legends to reflect the newer nation. In the 1890s, the German Empire built the Kyffhäuser Monument on the site of the medieval Kyffhausen Castle. 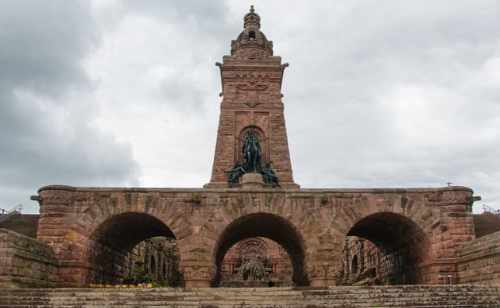 Despite being a monument to the late Kaiser Wilhelm I, it features a statue of Frederick. The statue refers to the legend since Frederick looks like he’s just woken up. Here, they tried to use legend as a means of legitimising the Empire’s rule. By linking Wilhelm with Frederick, they tried to suggest the German Empire as the Holy Roman Empire’s natural successor. Why are King in the Mountain stories important? It’s difficult to know if anyone ever believed the legends. Or if they’re simply folk tales, retold and passed on as the fiction they are. So we don’t know what ordinary people get out of them. For some, they’re simply additional tales about heroes who already enjoy plenty of legends about their prowess. Think of a figure like King Arthur. If you can believe he became king because he pulled a magic sword out of a stone, you can believe he’s still asleep somewhere under Britain. For others, the stories hold out a battered form of hope. Something along the lines of, “It doesn’t matter how beleagured your country is, there’s someone out there who’s coming to save you.” Hartland describes the sleeping hero myth as being “a tradition of a heathen god put down by Christianity, but not destroyed in the hearts and memories of the people” (2012 : 233). He also claims the tradition is free of politics but that “oppression” might help give the story more vitality. These stories could also provide a way to process the death of a hero or beloved king. King Sebastian of Portugal apparently died in a hectic Moroccan battle in 1578. Phillip II, Sebastian’s Spanish uncle, claimed Portugal in 1580. But only one person actually saw Sebastian die. The widespread lack of evidence led many to believe the king had somehow survived and would return. The trope does raise the thorny issue of national identity. It depends on the idea of the nation requiring aid of some kind. That tends to provoke ideas of ‘us’ and ‘them’, turning another nation into a perceived attacker. While that’s fine in fiction (“Gondor calls for aid!”), in reality, such divisive thinking can lead into very dark territory indeed. The notion of the ‘one true ruler’ is also tricky. The King Arthur legends appeal to more obvious myths and no leader would attempt to paint themselves as a descendant or heir. But the links made between Barbarossa and the Kaiser show the darker use of folklore to legitimise a contemporary ruler. Being aware of these tales is a good way to guard against people using them to push their own agenda. Enjoy this post? Sign up below to get notifications of new posts. Ashliman, D.L. (2019), ‘Frederick Barbarossa in Kyffhäuser Mountain’, Sleeping Hero Legends, available at https://www.pitt.edu/~dash/sleep.html#Barbarossa. Baughman, Ernest W. (1966), Type and Motif-Index of the Folktales of England and North America, The Hague: Mouton & Co.
Hartland, Edwin Sidney (2012 ), The Science of Fairy Tales: An Inquiry into Fairy Mythology, The Floating Press. A very interesting and informative post. I knew the legends about Arthur returning but hadn’t heard of Barbarossa before. Also, I’ve always connected Aragorn and the Pevensies to the myth of the returning Arthur but the phrase ‘King in the Mountain’ also reminds me of the dwarf king in The Hobbit. I think there was also a King in the Mountain story in the Discworld, something about the Diamond king of the trolls. Yeah, I think the dwarves are the Kings Under the Mountain. Knowing Tolkien, the reference was probably intentional!